Along with the wholesale redrawing of the map of Paris, Baron Haussmann transformed the urban experience by commissioning and installing tens of thousands of pieces of street furniture-kiosks, Morris columns, pissoirs, garden gates, and, above all, street lamps. 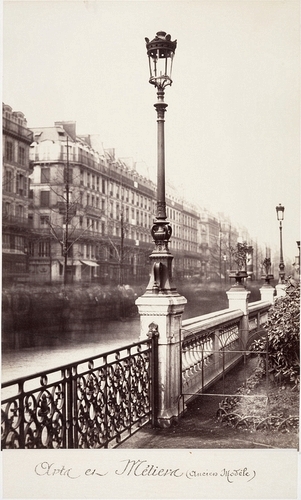 By the time Haussmann stepped down as Napoleon III's master urban planner in 1870, twenty thousand gas lamps had transformed Paris from a place where residents dared go out at night only if accompanied by armed men carrying lanterns into the City of Light. In this photograph from Marville's final suite of pictures, the flux of humanity flows past in a blur as Gabriel Davioud's street lights line the Boulevard de Sebastopol like proud sentinels of the modern city.